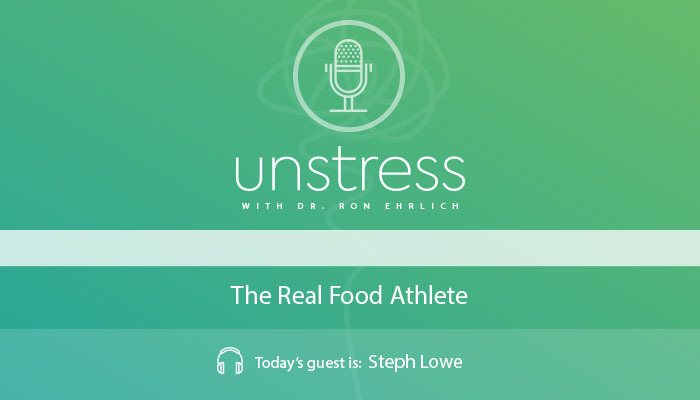 Steph Lowe joins me to discuss a real food approach to sports nutrition. Steph is a Sports Nutritionist who works with athletes at the top of their game. However, the lessons she shares in the episode are lessons for us all, even if you aren’t an elite athlete. Steph’s approach incorporates low carb and healthy fats, an approach that differs from the high carb recommendations traditionally promoted for athletes. We discuss the low-carb healthy fat approach and its effects on productivity and peak performance that is sustainable and low inflammatory, tools that we can all incorporate into our lives. Dr. Ron Ehrlich: Hello and welcome to “Unstress”, I’m dr. Ron Ehrlich. We’ve touched on the subject of low carb healthy fats but today we’re taking a different perspective Sports Nutrition. Now, most of you probably think of yourselves as good sports all of the nutrition is important but when you’re an elite athlete how should you actually prepare? Now, this is interesting because just like our programs of children’s health where I said even if you haven’t got kids learning about the health of the most vulnerable in our society, learning about what challenges their health and what are the best strategies for dealing with those problems. Well, they’re actually lessons for us all. I think the same applies to sports nutrition, elite athletes and nutrition. Even if you aren’t one there is actually much to be learned my guest today is Steph Lowe. Steph is a nutritionist having worked with elite athletes. She has a passion for spreading a positive message about real food. Her approach incorporates low carb and healthy fats. Now the stereotypical advice to athletes was always to load up with carbs to give yourself the energy you need. Now does that sound familiar to any of you non-athletes out there listening? I think it used to be referred to as the food pyramid which was more recently morphed into the Australian healthy eating guidelines. So, you don’t need to be an elite athlete to pick up some very important points here today. The low carb healthy fat approach for elite athletes and for the listeners of this podcast and its effect on productivity as well as peak performance that is both sustainable and low inflammatory are some of the things we cover. I hope you enjoy this conversation I had with Steph Lowe. Welcome to the show Steph. Steph Lowe: Hi, Ron thanks for having me. Dr. Ron Ehrlich: It’s a pleasure, it’s a pleasure. Listen now you’ve got a book coming out, we’re going to be talking about that later and you’ve been in this space for a while, but I wonder if you might share with our listener a bit about your own journey to this point. Steph Lowe: Yeah, for sure. It’s quite a long story but it did start back as a teenager actually when I decided I wanted to lose weight and very deeply into the calorie counting and low-fat world and quite ironic now considering what I do for a living and it’s obviously very opposite to that as we’ll explore today. But that was the trend back then as you listeners probably know and unfortunately, it didn’t lead to very good results. I mean yes I lost a lot of weight but I had hormonal problems and I was suffering from, what I believe was depression it wasn’t sort of diagnosed classically, but looking back we can clearly see that a significant lack of fats will really cause that imbalance in the brain considering how much it is made from those good-quality fats that we’ve been told to avoid for the last five decades. So, yes. Dr. Ron Ehrlich: Recurring theme on this podcast but I’ve got a few hills to climb before we get that message out, but this is what this is all about. And go on. Steph Lowe: Yeah so interestingly, I was obviously feeling not great not healthy and I certainly wasn’t feeling very happy and I met someone who encouraged me to try going gluten-free. Now, this is over 10 years ago I can admit I didn’t even know what gluten was and there certainly wasn’t the awareness or education that there is in 2018. I was pretty desperate at the time though, so I was willing to try anything and to kind of summarise it was night and day for me it was a huge catalyst for my health journey. I didn’t just go gluten-free I obviously then took a deep dive into looking at the literature and understanding the benefits of whole foods and really learnt firsthand the benefits of real food for health wellness and longevity. It sparked a big passion and that’s when I was inspired to go back to Uni and study nutrition at a tertiary level and I found my purpose in life and for me I can look back again and see that was also a huge part of my healing journey because I was quite lost as a teenager in my early 20s, partying and not taking care of myself because I didn’t really have that passion and nutrition was it and when I found it, it was a huge catalyst to health but also the success that I know how the natural nutrition is getting to share my passion with everyone on a day to day basis. Dr. Ron Ehrlich: And you’ve got a strong connection. You describe yourself as a sports nutritionist as well and what tell us a bit about that what defines that. Steph Lowe: Thank you. Yes so, we I mean I personally work with a lot of endurance athletes um many other athletes which I’ll get to, but it started with my personal experience doing triathlons. So, a number of years ago now I was looking for something to do instead of partying and an excuse to be going to bed early at night rather than being out and some friends of mine already doing triathlons, so I thought alright this is going to be something I’m going to give a try. And long story short I was exposed to the world of Gatorade and sports gels and the huge volumes of carbohydrates that we’re told to consume in the sports nutrition and in the endurance world. And I was just mind blown that we could possibly be fuelling our body with this kind of refined sugar and not using our intellect to appreciate that it’s probably not the right decision for our metabolism and for controlling inflammation and for athletic longevity. So, again I was really inspired to dive a little bit deeper. I’ve done a lot of research in with some mentors of mine including Jeff folic dr. Phil Moffett own and Tim Noakes. We were well ahead of the curve in the low carb space and starting to step away and I guess buck Convention which what I continue to do. We basically move away from the convention around the fuelling and the high carbohydrate diets and the Gatorade and the pasture party and we focus on fixing their metabolism and teaching the body to burn fat for fuel which is a huge part of your energy success. But I believe it’s the key to all of our longevity because fat is that beautiful clean fuel, we’re moving away from refined sugars which are very inflammatory and we know that inflammation is linked with most if not all chronic diseases so it makes a lot of sense when you think about it we just had the wool pulled over our eyes for so, so long. Dr. Ron Ehrlich: Now I want to dive into some of this. So, just remind our listener to know what a triathlon is? I mean there’s an Ironman there’s triathlon you got three events but go on. Steph Lowe: Sure, thank you for clarifying. So, a triathlon is an event which includes a swim followed by a bike followed by a run. They have very like lots of different distances. The most famous is the Ironman which is a 3.8-kilometre swim followed by 180 kilometres by cried finishing with a marathon which is obviously 42.2 kilometres. Dr. Ron Ehrlich: That’s just amazing that people will put their bodies through that and that whole event will take how many on a good to a bad range? What would be a record? Steph Lowe: I’m doing it in under eight hours these days. So, professionals under eight and then you have a cut-off of 17 hours. So, more recently there was a that I think the now officially the oldest athlete he was in the 85 I believe age group which is mind-blowing, and he made it in under 17 hours which is what the sort of official time is to be officially classed as an Ironman. So, that was mind-blowing in itself as well. Dr. Ron Ehrlich: It’s an extraordinary thing even at eight hours I mean 17 dozen but eight hours to put your body through that I mean it goes way past the glucose. Where are where are we getting our energy from at those levels? I mean I want to talk to you about what plays sports nutrition it’s particularly challenging when we’re putting our body through those extremes. But let’s just back up a little bit here and let’s go back to some basics because I know you very your approach is the healthy the real food you’ve got that acronym JERF – Just Eat Real Food. And people hear about low-carb but how do we define low carb? Steph Lowe: Yeah, interesting. I mean I think that there is a lot of confusion here so it’s a great place for us to be clarifying things. So, I intentionally use LCHF as lower carbohydrate healthy fat and sometimes you see low carb high fat and sometimes people assume low carb to be no carb and it gets very messy and it can go a little bit pear-shaped. I refer to lower especially because I believe it to be quite a sliding scale. So, let me break that down. We can go as low as 25 grams of carbs a day which research shows us is a very therapeutic model for reversing type 2 diabetes, obesity, metabolic syndrome and pretty low on that spectrum is where we treat childhood epilepsy. Now that might apply to some of your listeners, but it won’t apply to them to the majority. The other end of the spectrum is 150 grams of carbohydrates per day which I would prescribe to the few usually young lean male athletes so they’ve got age on their side they’re already at an ideal body composition male, they obviously don’t have the estrogen and the hormonal cycle like us women do at certain ages of our life obviously and finally very active because as I always say your carbohydrate requirements are relative to your exercise or your exercise output. And I know you’ve had Cliff Harvey on the show he’s a good friend of mine and he talks about that carbohydrate appropriate and I love that because it’s not one number that we give out to the world, it’s really important that we work out where we fit on that spectrum and I can give you some clues as to how our listeners decide if you’d like. Dr. Ron Ehrlich: I would. I would I think that would be like you’ve reached the bottom line thereof the therapy new type to epilepsy and we know and we’ve spoken to a few people about the power of the ketogenic because we’re heading into ketosis there on neurological conditions and then you’ve got your young lien males there’s a few people in between that scale isn’t it? Steph Lowe: Yeah, there is. So, in general, it depends on a few factors. Now firstly if you wanted to take the deep dive you would actually get some pathology testing. So, a couple of key things to look at. It is definitely your current level of blood sugar control or blood glucose levels which is more of an indication of sort of that daily today a response and can give you a bit of an idea of the meal that you ate the night before that blood test but taking it one step further we would look at your glycated haemoglobin which is known as hba1c. So, that’s a diagnostic criterion where will we get above 6% and up to 6.5%. We do get that official diagnosis of type 2 diabetes and then we know our optimal levels our 5.3% or under. So, if you get the hba1c blood test and you are 5.3% then we can put you towards the higher end of the spectrum because you don’t have an underlying degree of carbohydrate intolerance. Conversely, if your hba1c is 5.7 or anywhere near 6 then that’s definitely showing us that you’re heading in the wrong direction towards carbohydrate intolerance and there is already an underlying level of that which we need to reverse. So, that would put you towards the lower end of the spectrum. Now to give you some numbers I’d say around I actually usually like to prefer to go off 15 percent of your daily intake. So, again that can change a little bit depending on how much you’re eating but it’s going to be somewhere between fifty and a hundred grams of carbohydrates per day for the majority obviously to what closer to 50 if you’re hba1c is higher and then closer to 100 if you’re hba1c is that 5.3 or below. Dr. Ron Ehrlich: The interesting thing when people start examining this is the discipline of weighing and measuring and it’s not a lifetime thing it’s just something I think you need to do for a week or two just to get your head around what it is you’re actually eating isn’t it to benchmark? How do you get people going on this? Steph Lowe: Yeah, a great point because logging and weighing and measuring as you say I don’t believe it to be like sustainable it can cause unhealthy relationships with food and obsessions but initially I really do encourage it because there’s a huge amount of Education that we’ve been missing in the food space you would know this. A lot of people don’t even know that non-starchy vegetable hydrate so when we log and understand what we’re eating we really learn a lot more about the foods and we can it means we can be a little bit more strategic. I don’t feel this way about keto so much these days but even sort of five years ago it was very dogmatic and very restrictive, and people would with a fearing whole food like a little bit of fruit. They were fearing starchy veggies and I know this these foods might not suit everybody, but you can actually be quite strategic with what you eat in a day when what the sum total of your day is. So, let’s say you want to have a little bit of sweet potato especially when it is in that sort of cooked and called fashion as a resistant starch which supports the beneficial gut flora. You can include that in a low-carb template as long as you’re factoring in what everything else looks like in the day. It’s silly to look at one food in isolation that’s not how the human body works. We’ve got a look at the bigger picture and logging your food and looking at where things fit across a day and across a week is really powerful, I believe you go. Dr. Ron Ehrlich: Yeah and I think it’s important to kind of benchmark yourself to. It’s kind of people throw these terms around but you’ve got to know what it means in your own life. I thought that Cliff Harvey and Grant Schofield were terrific because this idea we got to be in ketosis all the time we’ve got to be low carb all the time we’ve got to be here we’ve got to be there. I love their fluidity about it and you’re talking about this sliding scale. I think that’s a that’s a great way of approaching it. Let’s get back to basics here too because the other half of the equation is healthy fats and I know our listeners will be reasonably but let’s just give them a review a revision of what you’re meaning by healthy fats. Steph Lowe: Yes, very good point. So, there are two main groups we talked about priority number one are our mega three so our polyunsaturated fatty acids that are found in foods like olive oil olives avocados nuts and seeds and they’re obviously really important to down-regulate inflammation being anti-inflammatory in nature, but they have some really amazing hormonal benefits blood sugar control satiety. They’re pretty magic foods if we break them down and all very natural in their whole food state. Most people are pretty comfortable with this group of foods, but our second group are our saturated fats. Now our poor saturated that have been taken and completely demonised in the last 50 years and to put it quite simply we were brainwashed to believe that saturated fats were directly linked with heart disease. They would cause high cholesterol and the low-fat era began and then the margarine industry started. So, saturated fats are found in grass-fed butter and ghee coconut and medium-chain or our MCT oil they’re found in grass-fed animal products and things like other animal facts such as duck fat or lard. So, you all are not so much because I know how much you talk about this topic but in my world a lot of people look at you like you’ve got two heads when you first tell them they can eat butter or look even a bacon like that’s mind-blowing for a lot of people because for many of us we only know low fat and we’ve had many people tell us to avoid these foods for so long. Dr. Ron Ehrlich: And actually, soberingly when one reviews the literature on this it becomes even more disturbing because the literature really doesn’t support it very well. The scientific evidence is not there but the commercial evidence is nominally there, but the scientific evidence is definitely not there. And the other thing I think people tend to forget is that a food isn’t just made up of saturated fat almost every food is a combination of the three saturated mono and polyunsaturated in varying degrees. Steph Lowe: Yeah great point actually because I actually way back in time as to where it all started and you’re probably aware of this but it’s really fascinating to look at how science was back then and it was literally three Harvard researchers that were paid the equivalent of I think it would be $50,000 to in this day but they would pay that much money to hide the research on sugar. Now conveniently paid by the sugar foundation and to present this research that saturated fat has it had a correlation with cardiovascular disease. So, very poor science obviously would never fly these days but yes thank God have come a long way. Dr. Ron Ehrlich: Yes, yeah, well, it’s a story that is very easy to miss but once you hear it very difficult to ignore. When it comes to low carb high fat lower I liked that lower carb healthy fats what are some of the myths what are some of the misconceptions about this approach? Steph Lowe: Yeah, really good question. I mean the whole fat makes you fat things one of the big ones I think in at least in the more Diet space yeah because everyone has done a low-calorie diet has been essentially eating low-fat high-carbohydrate so that upside-down template and simile. We’ve been told to avoid these foods not only for cardiovascular disease risk reduction but to lose fat it’s the unfortunate reality that the word is the same, but they have very different meanings. So, the mantra that we use is that helps you burn fat and for other people, that’s something they sort of almost wrote learn initially to retrain their brain do not be afraid of getting fat by eating a food that contains healthy fat. So, that’s a big one in my world but very life-changing when someone has the epiphany and to understand the physiology behind it as we know fats keep insulin levels low and that’s the goal yeah because insulin is a fat storage hormone so we want that hormone to be load to allow us to burn fat for fuel and then the magic is you don’t have to do it with calorie counting and restriction and flogging yourself at the gym which was the calorie fallacy of especially the 80s and 90s where what we were told to do is eat less and move more. Dr. Ron Ehrlich: Yeah calories in calories out I guess that’s another huge myth, it oversimplified everything I like that though fats help you burn fat. Now you mentioned chronic inflammation is the common denominator and in almost I think in all chronic diseases. Now if our listener wanted to reduce the effects of chronic inflammation what you mentioned gluten but what some of the foods we should be avoiding and focusing on? Steph Lowe: Yeah, really good question. I mean there are some top ones. I mean the first would be absolutely refined sugar and I think that you’d have to be living under a rock to have not learnt about the impact of sugar in the last sort of five years especially in Australia with the IQs movement which has done some amazing things for our awareness and obviously followed by that sugar film. So, definitely refined sugar which is most obviously found in like junk foods that are sweet in nature but they sneak it in everywhere because it’s a cheap commodity and it’s highly addictive it’s more addictive than a recreational drug so it traps us in a bit of a vicious cycle if we do consume too much because we’re bound by that addiction and the blood sugar rollercoaster that it does put us on. So, it’s a big one and a really important one to tackle like I personally don’t consume refined sugar like and in my heart ever. I mean there might be the occasional mouth or deserted snake in once a year but I don’t expect everyone to go that far but it’s the awareness of what you’re putting in your body and naturally when you look at acronym JERF which is Just Eat Real Food you are going to be removing the refined sugar, you are going to be gluten-free by default. Now, this is I think gluten is can be a bit of a controversial topic. It depends on who you talk to there’s an abundance of research that it’s a major contributing cause to leaky gut in the literature is known as that increased intestinal permeability that’s going to be inflammation 101 year. If your small intestine which has an outside covering that should look like a fly screen, if that fly screen has been torn in it then you can imagine what happens. We get undigested food particles we get this inflammatory cascade that creates a whole host of problems and we know that all disease starts in the gut. And so, too does all health so what we eat is so important especially because it really impacts the state of our gut. Dr. Ron Ehrlich: Yeah, that that’s a big one isn’t it? And I and I know we’ve covered this in in our podcast before but some of the modern we think is this a new trend as this become trendy and all this but actually the week that we’re consuming now is very different from the week that was consumed in those in the old days when letting bread be thy food or whatever the Bible said but the modern semi-dwarf high-yield wheat variety is higher in gluten. Steph Lowe: Absolutely and even I mean you would know about glyphosate but this week in the media we see articles coming out is it wheat or is it the glyphosate and there’s obviously that additional factor that our food is being sprayed with Roundup and we don’t have the genetic capacity or the tolerance for these chemicals that we’re being exposed to against our wills. So, naturally when you start to move away from gluten and refined grains you’re starting to decrease your exposure to glyphosate which is also a neurotoxin and that’s a very important health decision to make. And it’s mostly found in grains but unfortunately, our crops are being affected as well so that’s where we start to look at Australia’s version of the clean 15 and the Dirty Dozen and thinking about where we can prioritise organic if that’s possible for us to add into the equation. Dr. Ron Ehrlich: Yeah because that glyphosate we had a podcast where we talk to Charles Massey and he made the point that there were in the October beer festival there were 12 beers that were analysed and had glyphosate in them. It’s everywhere and it’s a major thing. So, yeah sugar gluten yeah obviously life said it thinks it’s always interesting when we talk about organic food is the research goes well there’s no difference in nutrient quality in organic or not organic and well maybe there is maybe there isn’t but there’s a big difference in what isn’t in the food not so much what is in the food isn’t in the food. But anyway, what else we got in terms of reducing inflammation? Steph Lowe: Yeah, so, falls to round things out with another two. We’re looking at reducing our intake of the polyunsaturated omega-6 fats. Now it’s not about removing them altogether, but we really want to look for that beautiful one-to-one ratio in relation to our meagre 3. So, Omega 6s can be found in things like some sour oil but they’re also in huge quantities found in things like the old school canola safflower and any of the more grain-based oils which belong in the bin in my opinion. So, moving away from those horrific refined foods refined oils especially and trans fats. So, you’re really getting trans-fat if you’re eating a lot of baked goods and pastries and junk food and deep-fried food. So, again if you make your one goal to be JERF just eat real food you’ll be significantly reducing if not eliminating these anyway and then we focus on what we are eating like I think it’s really good to discuss what to avoid but we don’t want to have that mentality of what I can’t eat. I always try and turn it upside down and talk about let’s talk about what we’re going to be putting on our plate and what we can eat and the benefits of that as a result. Dr. Ron Ehrlich: Yeah and well real foods a great place to start isn’t it? I mean that’s a very simple principle to follow. Dr. Ron Ehrlich: I think you’ve touched on this why this approach can have such a profound effect on disease management but I’m back to sports I’m intrigued about that and you mention the fuelling for some of these long-term events and the fact that Gatorade sports gels carbs, we thought that you had to carb-load to fuel the body. How has that changed? How do you have how do you advise an athlete comes in and goes look I’m on all of these great sports drinks and I’m carb loading before and you go whoa, whoa, whoa let’s rethink that – What are you saying to that person? Steph Lowe: Yeah, so, the education begins with looking at what we call the dual fuel system so Grants go field talks about this a lot when he does discuss the concept of metabolic flexibility. So, let’s break that down. If you eat a lot of carbohydrates like, try and throw the food pyramid if you’re following conventional fuelling guidelines as you say lots of sports drinks then you have access to one fuel tank only. That’s the glycogen that you store in the muscle which is how we store cover hydrate in the body and if you’re lucky you’ve got a couple of hours’ worth. The analogy we like to associate it is like a petrol running car, a car that runs on petrol, so you have to go to the petrol station all the time. Then the other option is our diesel engine anyone that drives a diesel car would know the difference in the frequency of attending the petrol station. Now that diesel engine is how or when we can burn fat for fuel. So, that is a sin surely an unlimited tank like talking hundreds of thousands of calories available which is more than enough for many Ironman and beyond and that most of us have on board but can’t access. So, the best of both worlds is what we call metabolic flexibility. So, you change what you eat and what you do and how you live to become fat adapted or able to access that diesel engine that’s that for fuel but you don’t drive your carbs down too low to miss out on your petrol tank or what we also refer to as the glycolytic tank which is actually really important for periods of high intensity. So, it’s a dual fuel system. We are able to rely on both rather than they’re just one which is that glucose or glycogen which the majority of the world, unfortunately, you can only access because of at least in the West our Dietary Guidelines to date. Dr. Ron Ehrlich: So, you need to be preparing for this and switching your body to be this metabolically flexible machine. And that is I guess by going lower carb and healthy fat in the weeks months I mean in your life. Being like that in life is a way of preparing for the event or do they need to prepare it in a more specific way? Steph Lowe: Yeah, we definitely start with the foundations of like what their food pyramid then looks like so we get them to build their plate with an abundance of non-starchy vegetables, small amounts of quality protein, healthy fats and we have a concept that we refer to as nutrient timing which is where we prioritise some whole food carbohydrates in the meal that you eat in the hour after high-intensity exercise. So, that’s an important part of the recovery process it enables us to top up that muscle glycogen, so we’ve still got access to that glycolytic tank that we discussed before that’s used for periods of high intensity and helps our performance our top-end as we say. So, that’s what we’re doing day to day. There’re other things to consider though as we know with stress. Stress management is a huge part of the equation because you can be as low-carb as you think you need to be but if you’re chronically stressed and your body is producing high cortisol the result of that will be for your liver to dump glucose into the bloodstream which will spark your insulin and switch off your fat burning. So, I have a more holistic approach with all of my clients and my athletes in particular because they do a lot of training and that in itself is a stressor, so we have to look at how we can balance that out across the week. I don’t look at it, I don’t look at stress being a problem in itself because we know that’s really healthy and the right dose but it’s often the absence of relaxation or the absence of what we would call the yin to the yang that’s missing a lot of people’s life. And then we also explore training like too many athletes do all high-intensity thinking that’s the answer to get faster and what actually happens is they get burnt out injuries inflamed adrenal issues hormonal dysregulation and they end up having to retire from the sport early. So, we have to re-educate them on how to train and we follow a very good friend of mine Dr. Phil Maffetone has something called the MAF method and it’s where you actually spend 80% of your weekly training at a low intensity which is that aerobic or fat burning zone and then only 20% is high intensity or glycolytic. So, a lot of education around that which I’ve also built into my online program LCHF endurance because you have to factor that in because training in high intensity all week is actually like to be completely blunt unintelligent and it’s not sustainable. Dr. Ron Ehrlich: I love this word that I’ve learned along the way hormesis – We put our body under intentional stress and that’s what these so that’s what exercise is which is a good thing it’s like taking a cold shower. But to be doing that for hour after hour in your training is that that’s putting your body under a lot of stress. I mean that’s taking hormesis beyond being therapeutic. Steph Lowe: Yeah, exactly and they’ve got to factor that in which is why it really needs to be holistic I think some people can get a little bit too focused on carbs only and like again like I love my athletes but they’re most often quite A type in nature which is very black and white and I believe that results happen in the grey. And so, my role is to pull people out of those extremes and teach them how to sort of usually soften and look at the longevity of the approach as well. Dr. Ron Ehrlich: Yeah, you mentioned after an endurance event that they’d have a carb meal an hour or so after to promote recovery. How do they prepare? How when you were doing your win when somebody let’s not sit you when you when people are doing their triathlon how should they be preparing in the hour or hours leading up to an event? Steph Lowe: Yeah, so that’s a good question. I mean a lot of it depends on what you’ve done in your training year so nothing new happens on race day is what we always say so let’s break this down. If we’re looking at our training so most of our training is actually going to be done in the fasted state. So, before we eat food like it doesn’t mean anything there are options including like black coffee or a bulletproof coffee or your version of that, but we don’t want to have any circulating glucose, so we can burn fat for fuel. It leaves for the first couple of hours depending on our current ability to access fat. Now a lot of people can actually then do that exempt strategy on race day. It’s very overwhelming to learn that for the first time that it is possible to not have your vegemite on toast before you do an endurance event because that’s what you’ve been told probably even on Ironman.com and it’s really hard to get your head around not eating breakfast when you’re staring down the barrel of 8 to 17 hours but it’s no food luck. You don’t do an Ironman nothing it is going to involve some sports fuelling. So, the way you’ve got to break it down in your mind is thinking about okay how long does my swim take in this case and how long will I then be on the bike where I can start refuelling? So, a lot of people that’s anywhere between an hour and an hour and a half and they’ve done way more than that in training. They’ve been doing two hours or more empty. So, it’s definitely possible it just that it’s so against what we’ve been told you need to like just to rip the band-aid off and do it once to prove it to yourself that it’s not going to go totally pear-shaped. And then we build in a strategy that is also practiced in training too as to how we fuel from that bag to the marathon to get us across the line. Now the whole goal when you’re fat adapted is that you need very little. Many, many athletes that I meet have been taught to literally cram in as much as possible so that they’re basically vomiting up what they’re putting in. And it’s just so unintelligent and inefficient especially when we consider the cost of digestion. So, digestion is obviously going to send blood flow to the gut if you’re putting in 90 grams of carbohydrates per hour which tends to be the upper recommendation, you’re playing a massive game of tug-of-war and you’re not getting the blood flow out the heart legs and lungs where it needs to be in an event clearly. So, it also means that you’re taking on a lot of fructose which is one of the most inflammatory sugars that also it causes gastrointestinal distress for a lot of people which is why we see athletes in the bushes with things coming out of either end. And again, it’s so avoidable when we learn to optimise our metabolism and we can literally take our fuelling back by half or two-thirds when we know we’ve got that diesel tank to rely on and we’re just topping up with small amounts of usually like minimally refined carbohydrates. I mean there are some athletes that get away with a little bit on a nice day but again I’m not completely extreme. I look at what we do the majority of the time not what we do every once in a while. Dr. Ron Ehrlich: Wow, I can just imagine athletes coming to see Steph who has heard this it’s like the low-fat Dogma that everyone’s so used to- This can’t be what you’re telling me can’t possibly be. Actually, you’ve got to rip the band-aid off I love that too. Listen, if someone was wanting to make that change who is accepting that lower carb and healthy fat is a good approach to have in their lives, what would be a few tips say three four or five tips to just get them started on their journey? Steph Lowe: Yeah, for sure I think it’s definitely changing how you build your plate so most of us are putting in those carbohydrates with every meal so we want to obviously switch to whole food carbohydrates like which would be a little bit of fruit and preferably resistant starch cooked and called sweet potato, potato white rice which can be reheated. And as I said that goes in the post-training meal make basically only like we really don’t need carbohydrates at any other time especially when we’re more sedentary during the day because we won’t burn that fuel just store it yeah which is the opposite of what we’re trying to achieve. So, I think it’s absolutely changing how you build your plate. I would look at I would look closely at your training and the ratio of aerobic to anaerobic training to make sure that we are getting closer to the 80/20. So, 80% aerobic 20% intensity but I would circle back around and encourage you to start to look at your gut health because you can eat all the real food in the world. You are what you eat but you are what you absorb. So, many athletes are missing out on this component because they either haven’t been taught or they’re just following blanket advice they’ve read online and Dr. Google can be pretty thoughtful at times but it can also lead to a lot of issues and at my clinic at the natural nutritionists we encourage everyone to get a fully comprehensive stool test called eight they call microbial analysis. So, in summary that looks at all of the beneficial bacteria that do or do not live inside large intestine and if there are parasites or overgrowth that need to be dealt with to address long-term health but performance because if you’re not absorbing the nutrients that you’re eating you’re not going to get the best of your food nor your body. So, we have to be looking at healing and sealing the gut with foods like bone broth. We need to be consuming our resistant starch which a lot of people completely cut out when they go low-carb because they’re afraid of potatoes and we’ve also got this sort of fear in the West about fodmap foods when fodmap stands for the fermentable oligosaccharides disaccharides saccharides and polyols and they can ferment in the gut and cause typical irritable bowel syndrome or symptoms I should say. But ironically the onions leeks garlic’s artichokes and asparagus really, really great prebiotic foods and we need these prebiotics to feed the probiotics the beneficial gut flora that have such integral roles for absorption of the food that we’re eating but production of serotonin our immune system downregulating inflammation and the list goes on. And then we need beneficial probiotics, but people are drinking kombucha like its soft drink they’re creating yeast overgrowth sand. They’re not looking for diversity that the ultimate goal for our gut is to look like this beautiful rainforest. So, visualise one in your mind’s eye for me now and think about what you’d like rainforest to look like. It’s the only probiotic you’re consuming is kombucha it will look like one tree in that entire rainforest. If you eat the same food all the time you’ll do the same thing your rainforest will become very low in diversity. So, two very basic but extremely important goals are food diversity and the diversity in your probiotics or fermented foods and drinks. And you don’t need a degree in nutrition to understand that, but we are all I think a little bit too habitual sometimes and it starves our gut and we end paying for it as a result. Dr. Ron Ehrlich: No, that’s fantastic. It’s been terrific I’ve got so much out of this look I want to just finish up now Steph I’m just taking a step back from your role as a nutritionist and sports nutritionist and bearing in mind we’re all on this health journey through life – What do you think the biggest challenge is for people today in our modern world on that journey? Steph Lowe: I honestly think the challenge is lack of prioritising time. Like a lack of dedicating time to this goal because in the West most food is going to be carbohydrate. Think about what you’ve got available to you when you’re on the go or grabbing something quick. Rarely are you really going to get lots of non-starchy vegetative proteins and healthy fats I’m not saying it’s not possible but it’s a lot more effort. Now we always talk about this hour of power on a Sunday which is food prep to set your week up whether it you make your frittata for breakfast or you make a slow-cooked meal for the week when you’re going to be busy. But the one thing is like you can’t do that one week you can’t prep food one week you’ve got to do it as part of the lifestyle change and when you find a way to make that fit in your busy week everything flows. It’s a huge catalyst for things to be heading in the right direction but I think a lot of people drop that ball and then they pay for it because they’re eating quick food and eating more carbohydrates feeling tired having cravings and it’s all a direct cause of our previous food choices. So, carving out time and making it a priority every week is the answer to make this sustainable and look after your longevity. Dr. Ron Ehrlich: Steph thank you so much that was fantastic. Look we’re gonna have links to your website in this great new book that’s coming out at the end of November. So, thank you so much for joining me today. Steph Lowe: Thanks for having me. I love what you do. It’s so great to be on your podcast and let’s connect again soon. Dr. Ron Ehrlich: Thanks Steph. I love that term hour of power on Sunday. I actually love to get lost in the kitchen and often spend hours preparing food on Sundays. It’s meditative creative satisfying mentally and physically. I love to fill the fridge up with some good dinner’s, pate, roasted vegetables… Oh, I could go on. But it highlights that being organised is an important part of your week. I also love this just eat real food message simple but profound, isn’t it? Also, interesting to see athletes discovering low-carb healthy fats and not just surviving but thriving. Have a listen to the episode I did with Dr. Gary Fettke the orthopaedic surgeon from Tasmania who was taken to task by the medical profession for wait for it championing the low-carb healthy fat advice. Having seen the ravages of the low-fat food pyramid approach and contrary to industry-sponsored advice that comes from most professional organisations. Just to remind us that there is justice in this world he was of course completely exonerated just recently. That episode was earlier this year as well as to more recent ones with Cliff Harvey and professor Grant Schofield. Now we’ll have links to Steph’s website the natural nutritionist and her new book “Low carb healthy fat nutrition”. So, we’ve got some really exciting things happening coming up. We’ve got six new eBooks – Sleep breathe nourish move and think coming out soon. The sixth is actually all of those bundled together into one. We’ve also got a three-part webinar series. The first part is doing an audit of our health and our approach to health care. We have got some exciting things happening with six new eBooks – Sleep, breathe, nourish, move and think coming out soon. The sixth is all of them bundled together. I’ve got a three-part webinar series doing an audit of our health and our approach to health care. That’s the first part. The second part goes on to explore why public health messages are so confusing and contradictory and specifically the role of the food and pharmaceutical industry in all levels of health care. And in the third part, it’s about taking control of your own health by identifying and minimising the five stresses in life. We’ve also as though that’s not enough wait for it there are steak knives here included. No, there’s not. We also have a new five-week online course – The five pillars of health starting soon. So, lots and lots of things happening, people watch out for them. So, until next time, this is Dr. Ron Ehrlich. Be well.